MyMemories Blog: Today's Daily Designer....Happy Scrap Arts! Today's Daily Designer....Happy Scrap Arts! 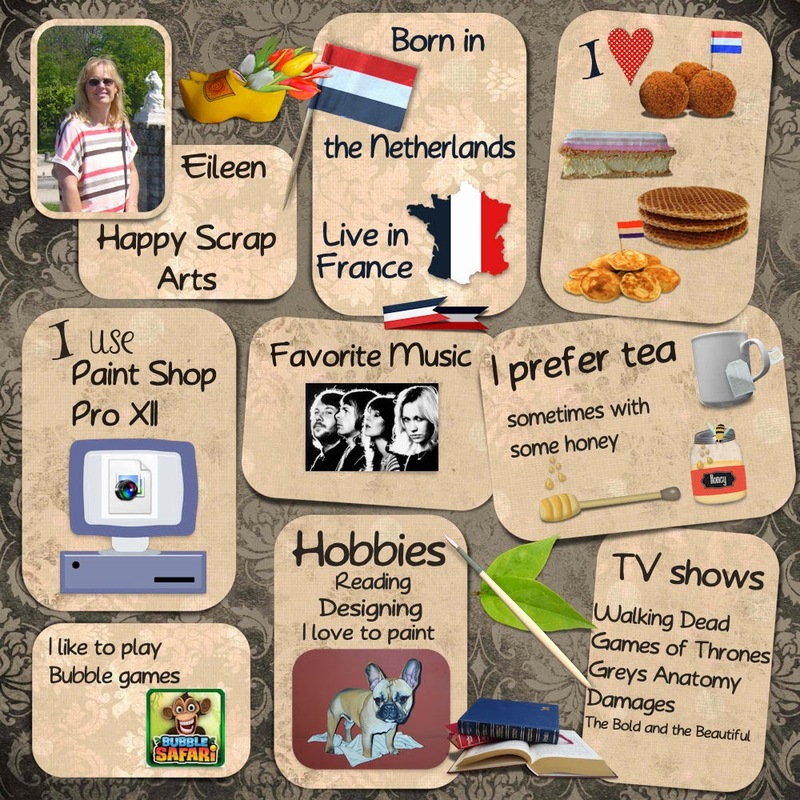 My name is Eileen, AKA Happy Scrap Arts and I'm dutch but I live in France since 1988. I got to know my husband in France. So we got married in 1989 and I stayed here. It will be 25 years in august. I'm scrapping for more than 7 years know and I'm a designer for about 5 years. I started scrapping my photos when I was a little girl; my mother started to scrap my albums when I was born. I continue doing it, writing little stories with my photos and decorating pages with drawings, stickers etc. I also started albums for my kids. After all those years I had so many albums, 49 for me and about 20 for each of my kids. So I had no place to store them anymore and find out about digital scrapbooking. So I started to make digital photo books, they take less place and you can put so much more photos in there. I prefer digital scrapbooking as it takes no place and less equipment. As I am very creative I soon started to make my own digital embellishments and papers. Check out Happy Scrap Arts's Design Shop and enjoy 45% OFF TODAY ONLY!!! Congrats Eileen , this is great ! love all about you placed in here , and love to work on your kits as your ctmember. keep the lovely kits coming Eileen. hugs Nelleke.